Congratulations 2013 Canada Day tournament winners Adam McIsaac and Tara Kelly! 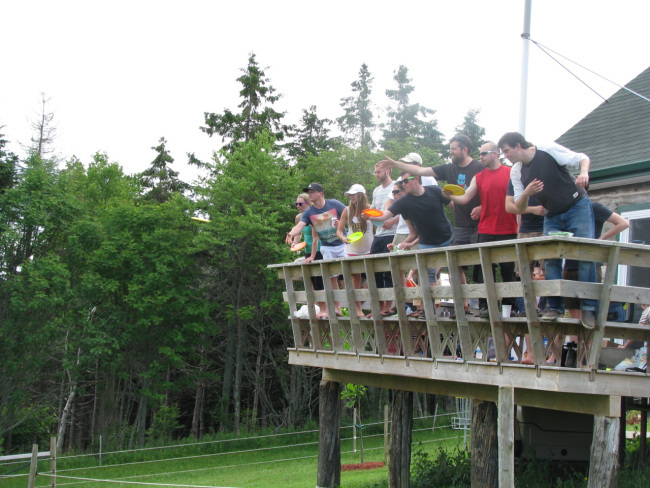 Our 2nd annual Canada Day tournament was held on June 30th – what a lot of fun! The women declared their winners after 18 holes of play – Tara Kelly first, Andrea Laird second and Jenn Slemmer third. Way to go, ladies! The men selected the top four finishers after 18 holes. They were Adam McIsaac, Chris Richard, and Niall Stanley and Jeff Dohoo who just squeaked out Josh ‘Aceman’ Coles by one birdie out of the playoff. These four played another 4 holes to determine the top placing. It was exciting and close, followed attentively by all the other tournament players who formed the ‘gallery’. When the four holes were complete, Adam McIsaac had won by one shot, followed by Chris Richard and Niall Stanley tied for second, and Jeff Dohoo fourth. What a close finish and an awesome playoff – let’s do it again next year!